Commentary and errors: This record is before the 1909 birth of my great grandfather Raymond Wolford. The census enumerator, Mr. Wesley G. Pliley (sp? ), misspelled the names of Agness (Agnes) and Hommer (Homer) Wolford. 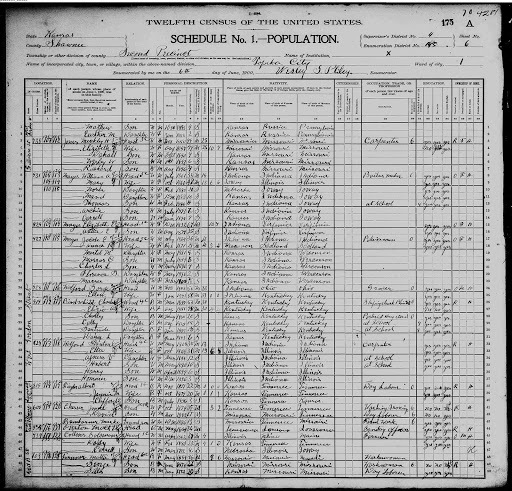 1900 U.S. Federal Census, Shawnee County, Kansas, population schedule, Topeka City, Enumeration District 45, Sheet 6, p. 175 (stamped), Dwelling 131, Family 131,. Stanton M. Wolford; digital image, Ancestry.com (http://www.ancestry.com : accessed 23 September 2012), citing National Archives microfilm publication T623, Roll 500.